A homemade speedboat has held the deadly water speed record since 1978. 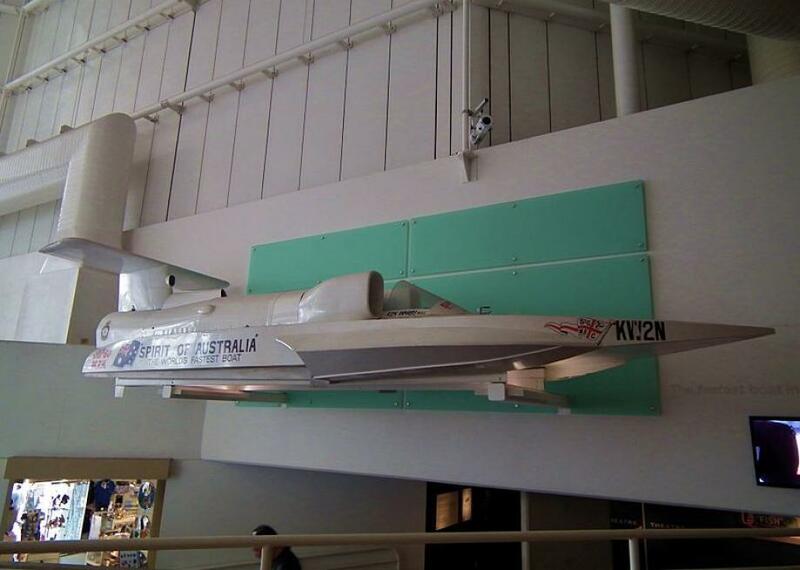 The world’s fastest boat now hangs in the National Maritime Museum in New South Wales. Boating can be dangerous. Trying to be the fastest boat ever recorded is insanely dangerous. Getting boats up to speeds in excess of 200 miles per hour using rockets and aerodynamics is about as hazardous as it sounds, but the story of the craft that broke the record back in 1978, and which still holds the world record today, is truly remarkable. Ultra-fast boats pose a number of dangers to the pilots, ranging from hydroplaning out of control, to colliding with a small swell that can send the boat flipping end over end, to a malfunction of whatever powerful engine of choice is riding inches from the pilot’s head. Since 1940, there has been about an 85 percent mortality rate among water speed competitors, making it not only one of the most fatal world record categories out there but setting the bar for beating it unusually high. When you think of the kind of sleek, perfectly balanced craft one might attempt to break such a record in, the last thing you would imagine is that it would be built by an amatuer in the backyard of his home, using parts salvaged from random resellers. But that is exactly how Australian dreamer Ken Warby built the amazing speedboat that set the world water speed record. As a child, Warby looked up to British speed demon Donald Campbell, who had broken and rebroken the world water speed record throughout the 1950s and 1960s in various evolutions of his Bluebird speedboat. Campbell likely would have continued to break water speed records were it not for a fatal accident during an attempt in 1967. His boat spiraled out of control going hundreds of miles an hour and was smashed to bits, decapitating the daredevil in the process. Campbell’s body wasn’t even recovered until 2001. Regardless of the danger, Warby, who by the early ‘70s had become a power tool salesman, never gave up on his dream of walking in his hero’s footsteps (or, rather, boating in his wake). In his spare time, Warby began drawing up plans for a vessel of his own, that he hoped would be able to once again break the world water speed record. After two years of planning and designing his water rocket, named Spirit of Australia, Warby began actually building the ship in his backyard. He bought the wood and material for his boat piecemeal as he got the money to afford new parts and put the whole thing together using mostly hand tools. A model of the Spirit of Australia. For a propulsion source, Warby bought three small, used jet engines from a Royal Australian Air Force auction. The surplus jet engines were capable of pushing out over 3,000 pounds of propulsive force each, more than enough to get his ship up to record-breaking speeds. It took Warby another two years to gather all of the parts for the crude initial version of the Spirit of Australia, but he was finally ready to test it. Although it was missing many of the engineering bells and whistles of other record-breaking speed boats, including valves and intakes that would keep water out of the engine and other unwanted places, Warby’s design was sound. During the ship’s inaugural run on the waters of Lake Munmorah, New South Wales, it reached a top speed of over 160 miles per hour. At the time, the world water speed record was held by American daredevil Lee Taylor, who had gotten his own boat up to over 280 miles an hour in 1967. Warby’s boat was a far cry from the world record, but he was undeterred. Warby continued to chase the record, making small improvements and tweaks to his boat, increasing his speed with each test. Devoting himself fully to the project, Warby began touring Spirit of Australia around gas stations and malls, raising money for the endeavor. He even taught himself to paint and sold paintings along the way to help fund his need for speed. 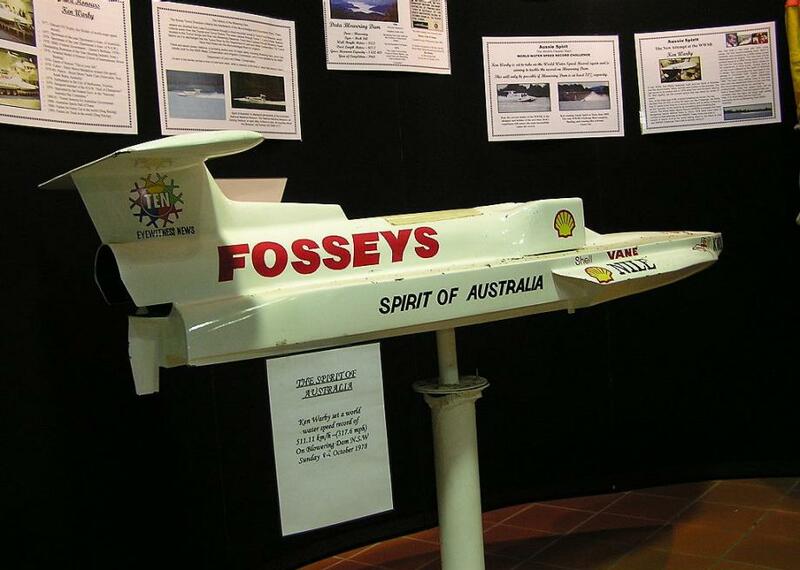 In November of 1977, Warby finally set his first world water speed record on the Blowering Reservoir with a much improved Spirit of Australia. He chose the dammed-up lake for the long “runway” it gave him to get his new and improved boat up to speed. Having trialled and tweaked the vessel over the years since his first test, Warby was able to reach just over 288 miles per hour, beating out Taylor’s record by a little over three miles per hour. He’d finally achieved his goal, but Warby didn’t stop there. Having built up a small team of experts during his bids to break the world record the first time, Warby worked with them to get the Spirit of Australia over the 300 miles per hour mark—a feat no one had ever managed to achieve. He had input from a wind speed expert at the University of New South Wales, and Royal Australian Air Force engineers were able to fix up the old jet engine he was still using, so that it performed as good as new. Warby had also garnered some sponsorship from various companies like Speedo and local department store chain Fossey’s, although the homemade core of the craft remained intact. Less than a year after he had broken the record the first time, Warby and the Spirit of Australia returned to Blowering Dam in October of 1978, and pushed the boat to the limit. The craft sped across the water, topping out at a mind-boggling 317 miles per hour. Warby crushed his original record and set a standard that has yet to be beaten. This is not to say that people haven’t tried—it’s just that no one has survived the attempt. Taylor, who held the record prior to Warby, attempted to retake the title in 1980 using a speed boat powered by a rocket. The weather on his test day was not ideal for a speed run, but Taylor went for one anyway as not to disappoint the gathered crowd. Unfortunately, somewhere near the 270 miles per hour mark, the boat became unstable and crashed into the water, coming apart and killing the pilot. A second attempt to overtake the record was performed in 1989 by Craig Arfons, but again, as the boat reached 300 miles per hour, it flipped off the water, somersaulting multiple times before coming to a stop in the water. Arfons died not long after. With death ahead and death behind his record-breaking run, you might think that Warby would knock it off with the deadly water speeds. Not so. Warby and his son, Dave, are currently working on Spirit of Australia II, a more advanced version of the original record-breaking boat, set to begin test runs in late 2016. Other contenders from Britain and America are also working on possible record-breaking craft. It remains to be seen who will survive to accept the title.